Today I took a test sponsored by RealAge.com. I suggest you give it a try. After you’ve finished, you click a button and it gives you your “Real Age” –biologically and emotionally speaking. 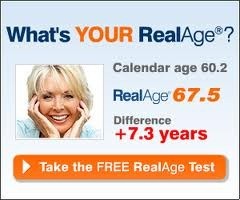 I’m 63.8 which is disappointingly close to my calendar age. on to tell you how to get your age down even lower. (I can lower my age by six months if I add 10 minutes to my morning walks and force myself to eat one more vegetable a day) You won’t be in high school again, but you could hit your 50s all over! Try it. You’ll learn some interesting things about yourself. One of the recommendations for me – stemming from a questions regarding anxiety – was to repeat the following statement each morning or while driving around town, or pulling weeds, etc. “I’m good enough, I’m smart enough, and, gosh darn it, people like me.” Turns out a positive mantra like this is no joke. It might even be key to staying stress- and illness-free. Yep. Real Age goes on to remind me that healthy self-esteem may help dampen the body’s stress response. That in turn can mean less wear and tear on the heart and immune system. Okay. I’m awesome – a wee little lie shouldn’t make my nose grow too long. Note to Self: I Rock! So, bottom line, loving yourself more may mean your body is armored against stress. And how, exactly, can you love yourself more? Let us count the ways: For starters, spend lots of time with supportive friends and family members. Research suggests that a supportive social network is good for self-esteem. You can also use positive self-talk to help yourself feel better. Here’s a link you can try (if I did it right). Good luck. Hope you do better than I did. 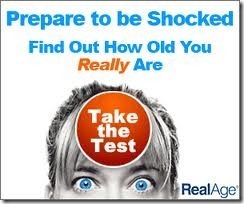 This entry was posted in Coping with retirement and tagged Real Age test is a shocker, Test for your Real Age by Emily Jones. Bookmark the permalink. Hey Em, don’t feel bad about the Real Age test. I have determined it is rigged. I was determined to get an age lower than my real 62. I got a 56.7 which should be good, but the thing is I lied about almost everything and still just came down 6 points from my real age. I said I had a 24 inch waist, a cholesterol average of 140, sleep like a champ HA, eat all the food groups faithfully, had no worries, never stress, HA HA HA HA HA and they still didn’t cut me a break!